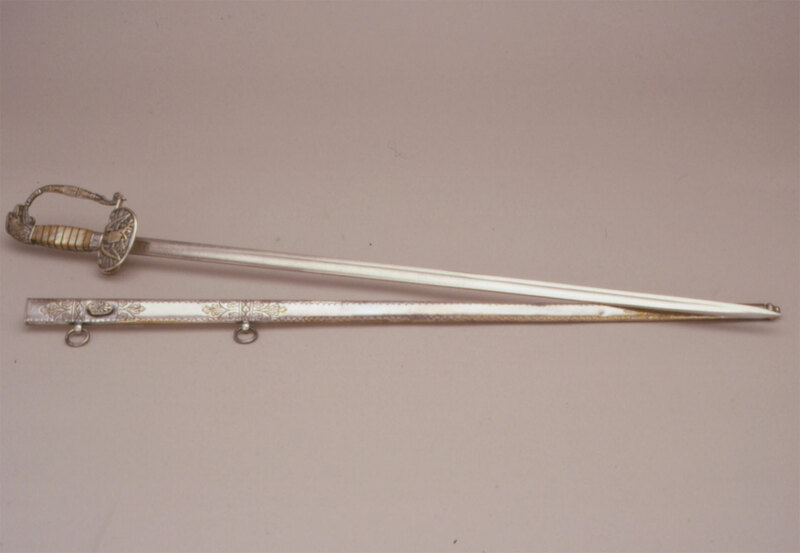 Perry Moses acquired this militia officers’ sword while he was a cadet at the South Carolina Military Academy—The Citadel—and carried it with him when he enlisted in the Palmetto Guards of Charleston, Captain Cuthbert commanding, in 1860. 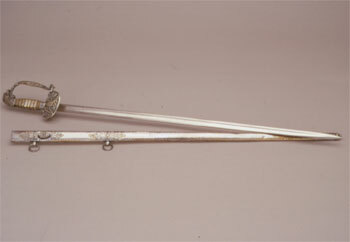 Manufactured sometime between 1840 and 1850, such swords were commonly used by southern officers early in the Civil War. Fourth child and third son of Octavia Harby and Andrew Jackson Moses, Perry Moses was born in Sumterville in 1844 and spent most of his first 16 years in the family’s Washington Street home. During the war he served with Kershaw’s 2nd South Carolina Regiment and later was sent to Mississippi and Alabama where his brothers Joshua and Horace were stationed. Jack Levy, a friend of Perry’s father, had moved his family to Mobile, Alabama, sometime after the Union forces captured New Orleans in April 1862. Levy took the Moses boys under his wing and invited them to his home for dinner. According to family lore, the Levy daughters Rosalie and Adele peeped through the blinds and each claimed a man: Rose indeed later married Perry and Adele, Perry’s brother Jack. Perry and Rosalie returned to Sumter, but soon moved to the Louisiana bayou country where they lived for 12 years, working in the fields side by side. Again, family legend claims that Rose picked three hundred pounds of cotton the day her fourth child was born. After the birth of their sixth child, the couple moved to Bell Buckley, Tennessee, then back to Sumter where Perry opened a sawmill and lumber business. He later owned a cotton oil mill and farmed on the side. In 1892, Perry’s mother sold her old home, which had been used for three years as a graded school, to her daughter-in-law, Rosalie, and it once again became the center of Moses family life.